From Pit Bulls to Celine Dion – Big or Small, She Loves Them All. Trips to Vegas to see Celine, and opening her home to foster Pitties in need are what feed her passion. Sweet treats are what feed her sugar cravings. She will do tricks for treats, and accepts all sugary bribes! Proud mom to son Noah, one dog, Nemo, three cats and a bunny, she is more comfortable trimming a 200 lb dog’s nails than her son’s! She’s a natural at holding your fur baby and awesome at wrangling your human baby so you can focus on the veterinarian. Tara grew up on an egg farm, and as a child, she worked as a horse trail guide. 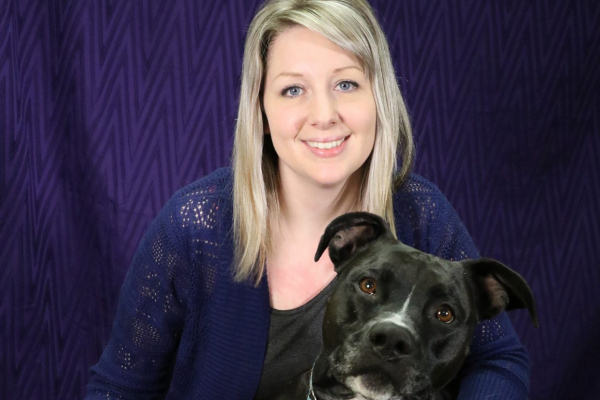 Now her dream is to be “Old MacDonald.” And don’t let appearances fool you – she has 11 years of experience in the industry, and is always eager to help with client education and to give advice wherever needed. Tara graduated from the Vet Assistant course in 2007, and is one of our original staff members from when we first set sail in November 2016.